...and has a protective cover in the tub. 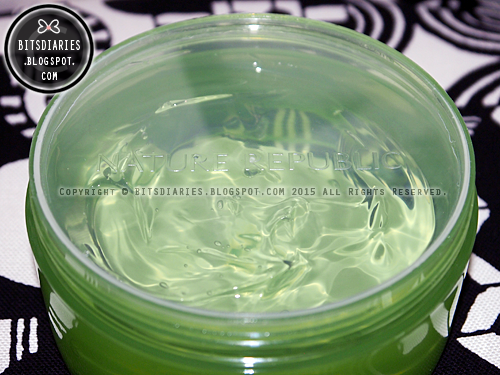 This is how the aloe vera gel looks like in the tub with the protective cover removed. It has a nice fragrance; very perfumey and I find it overpowering as the scent lingers on my skin for some time after I washed it off. 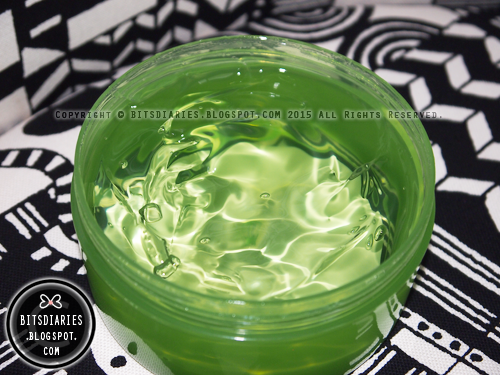 The aloe vera gel is transparent in color and has a lightweight gel-ish-watery-like texture, which makes it easy to apply. 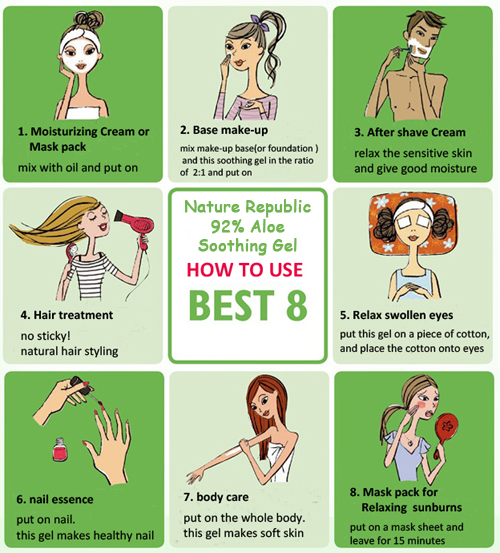 I've tried it as a body lotion. It does not feel oily at all and it gets absorbed into my skin very quickly leaving a matte finish, without a greasy or sticky residue. 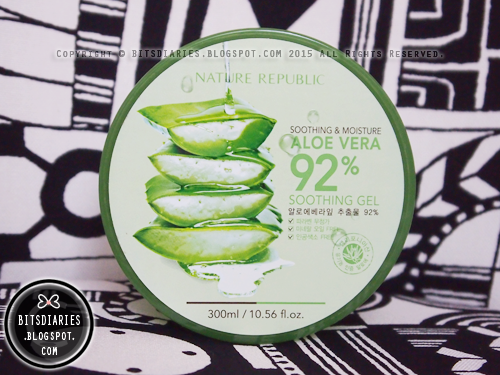 Once I applied it on my skin, my skin immediately felt a cooling sensation, which soothed my skin and I quite like the sensation this aloe vera gel gives. FYI, I have dull, dry and flaky skin on my elbow and I applied some aloe vera gel on my elbow. Take a look at the pictures of BEFORE and AFTER application. P.S: I wanted to take a picture on how the gel looks upon massaging on my skin, but it absorbed into my skin way too fast and so I failed to capture the moment... lol. In the BEFORE picture, you can clearly spot the dull complexion, dryness and flakiness issues on my elbow; and my skin looks very rough. Whilst in the AFTER picture, there is a significant improvement - less flakiness. My skin definitely looks and feels smoother and softer after using the product, but in terms of moisturization, I wouldn't say it is very moisturizing. 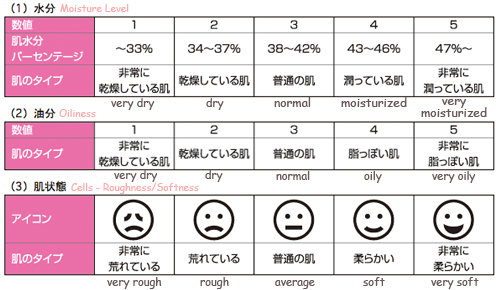 The standard value of water level is 38%++, 3-5 bars (normal to very moisturized). The standard value of oil level is 3 bars (normal). - means balanced, which is neither too oily nor too dry. *My skin oil level gained an extra bar and that doesn't mean it is too oily okay! The standard value of oil level is 3 bars (normal range) hence, 2 bars is a positive results. 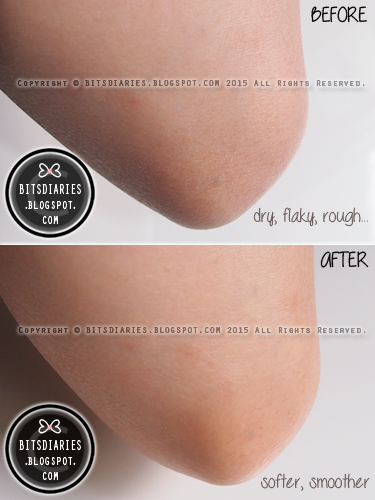 However, my skin is still in the dry range. Refer back to "Measurement Guide" and "Analyzing Standards" for more info. Let's do an OIL TEST~! 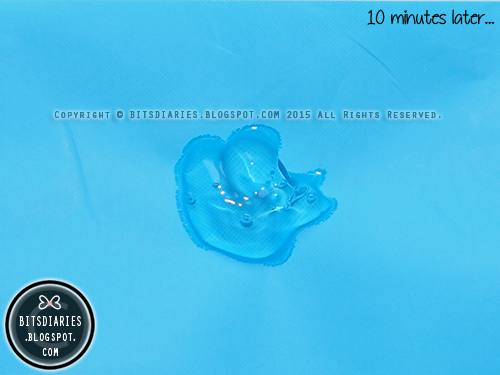 I scooped out some aloe vera gel onto a sheet of Clean & Clear oil blotting paper. 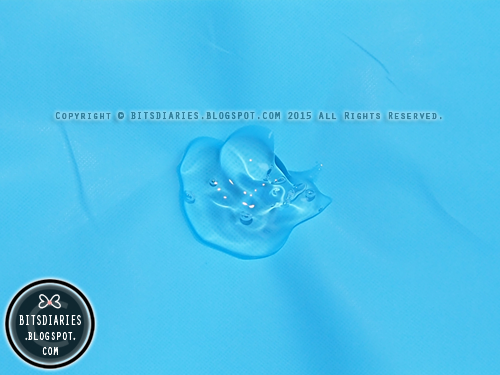 Can you see the oil traces dispersing around the gel? 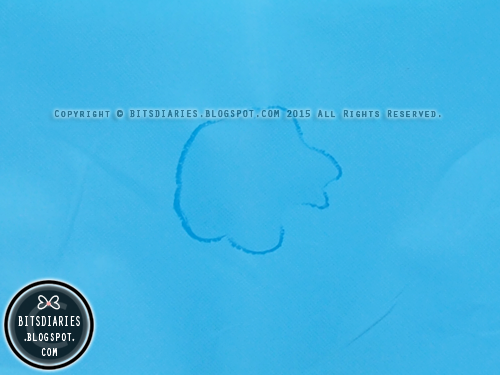 A clearer view on the oil traces. So this is why my skin oil level gained an extra bar huh? HAHA. 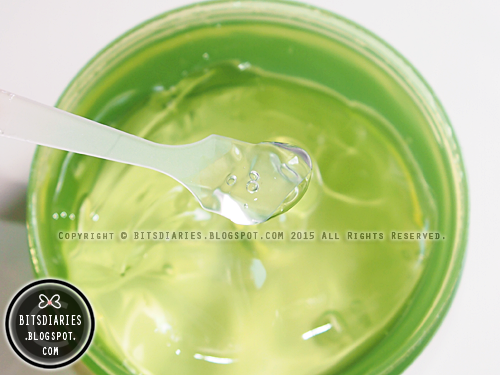 Even though this aloe vera gel shows some signs of oil traces, it really does not feel greasy. 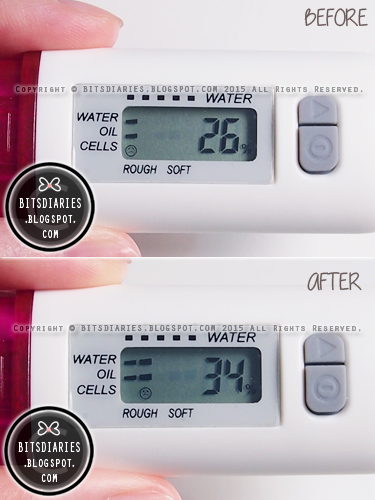 Besides, if this is a very oily product, the skin analyzer device should have detected it and the oil level should obtain the result of 5 bars instead of just 2 bars. Anyway, I have also tried it as a wash-off and sleeping mask on my face and it did not cause my skin to breakout. With that said, I think this product is suitable for oily skin as well. 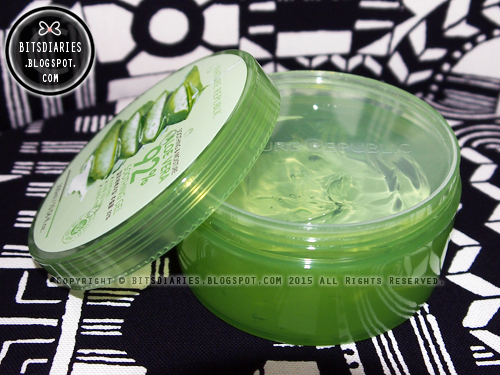 In summary, this product is very soothing and it does a great job in calming and cooling down the skin. It does moisturize the skin as shown in the skin analysis results but is not very moisturizing; it's moisturizing ability is not up to my expectation and in my opinion, it is more on the soothing side. Another downside of this product is that it comes in a tub without a spatula and I find it unhygienic to dip my fingers constantly into the tub. I'm glad I have several spatulas at home~ lol. All in all, this product is a perfect 'cool-down' treatment for the summer season/hot days and is suitable for all skin types.